This article is about enemies who are werewolves. For the condition lycanthropy, in particular the effects it has on you, see Werewolf. 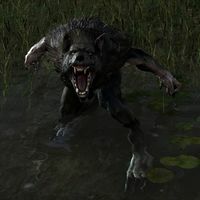 Werewolves are monstrous, wolf-like creatures. They are taller and broader than man and mer, and are capable of moving on two limbs or sprinting on all four. They have a weakness to poisons, but are incredibly strong, and very fast. You can become a werewolf if infected. This unlocks the ability to transform, as well as an associated Lycanthropy skill line. This page was last modified on 15 August 2018, at 07:07.